Nobody asked Roberto Romo of Bobby’s Auto Parts if he wanted a parklet in front of his shop on York Boulevard, but he isn’t complaining. The owner of the 25-year-old business says he was invited to planning meetings on numerous occasions, received phone calls and letters in the mail, but didn’t attend until a meeting congregated on the sidewalk outside his shop. That’s how he found out the parklet was coming to his doorstep. “It’s good, hopefully people will use it,” Romo told EGP in Spanish, agreeing that maybe it could be good for business when people sit down and look up at his shop and remember they need windshield wipers or another item. The York Boulevard parklet, which opened last Saturday, is the first of four parklets or mini parks, being built as part of a pilot project in Los Angeles Council District 14 (CD-14). Two parklets are planned for downtown, including one in Councilman Jose Huizar’s district that will open this morning (Feb. 7 at 9 a.m.) with a ribbon cutting at LA Café, located at 639 S. Spring St. A second parklet on Spring Street, in Councilwoman Jan Perry’s district, will open at a later date. The fourth location in CD-14 will be in El Sereno on Huntington Drive, with a grand opening celebration scheduled for Feb. 16. The parklets are part of a pilot program involving residents, local organizations and businesses, the LA Dept. of Transportation and CD-14. The mini park spaces are intended to encourage pedestrian and bike traffic on commercial corridors, following a trend in other major cities like San Francisco, Boston and New York. 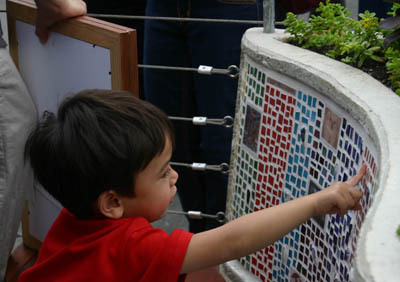 The York parklet features mosaic glass tile designed by artist Cathi Milligan of the Glass Studio. The new mini park was sponsored by the Highland Park Chamber of Commerce, the Historic Highland Park Neighborhood Council, LA Conservation Corps, LADOT and local residents and business owners who attended and sponsored meetings, according to Huizar’s office. The parklets are the result of a motion introduced by Huizar and Perry in 2011 that also directed city departments to develop a long-range plan to support parklets throughout L.A., according to Huizar’s office. The York parklet cost $30,000 to create and will be maintained by the Highland Park Chamber of Commerce. During the Feb. 2 ribbon cutting, Huizar announced a deal had been reached to create a park on an empty lot at York and Avenue 50, just a block away from the York parklet. The future park is part of the York Vision Plan and would be paid for using $2.85 million in Proposition 84 funds. According to Huizar’s office, after the sale is complete, community meetings will be held to allow residents to give input on the park’s design. February 7, 2013 Copyright © 2012 Eastern Group Publications, Inc.